The best ones, we think, are full of people, with wonderful staff, exciting menus (with a solid amount of comforting traditional food) and have a real buzz about them. 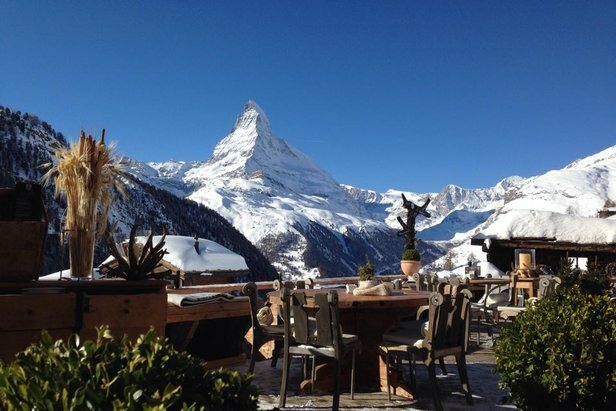 Check out our favourite mountain-top restaurants below. We’re salivating already . . .
Chez Vrony is fine dining (i.e. 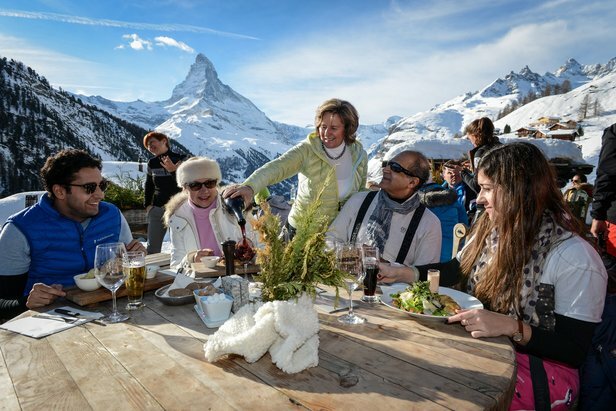 expensive) atop a mountain with glorious views of the Matterhorn. The vibe is rustic/posh, and extremely welcoming, which makes you feel all warm inside. Care has been put into sourcing the right produce – everything is organic and local and the animals are Alpine grass-fed which makes for juicy, tender, near-perfect cuts. The menu has traditional Mediterranean dishes and more unusual offerings too. The soups are particularly good and there are a number of different varieties to try. Feeling traditional? Go for the fish soup. Suffering from a hangover? Try the Bloody Mary soup – otherwise, there’s succulent organic lamb, homemade sausages and the classic tartiflette. And if none of that takes your fancy, then the burgers (soft buns, crispy bacon, creamy coleslaw) are simply great. One thing that takes a restaurant from good to memorable is service and at Chez Vrony the entire dining experience is made all the more pleasurable by the hard-working waiters who treat everyone like a VIP. Very enjoyable, this a standout restaurant that’s deserving of the hype. To reach Chez Vrony, take the ‘6’run from Sunnegga to Findeln. The restaurant is just a few steps away from the lift. 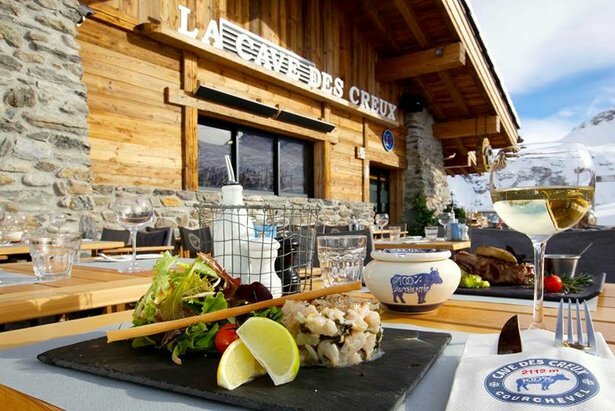 Run by two dashing brothers who were ski instructors in their former lives, Cave des Creux serves a brasserie menu with an expensive selection of Savoyard specialities complete with a homemade dessert buffet. The atmosphere is one of relaxed luxury. 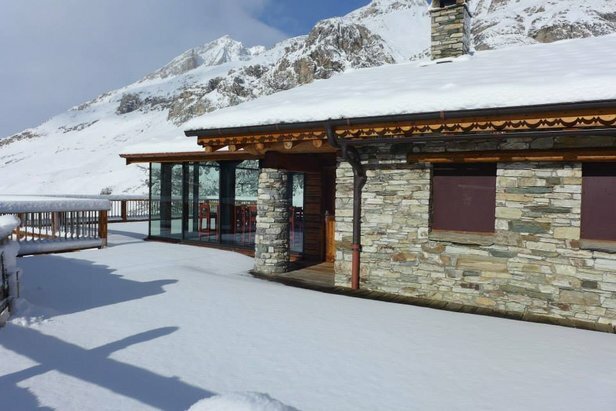 Inside the restaurant, diners can enjoy lunch around the central fireplace while outside, on the south facing terrace, guests can soak up views of the Courchevel Valley and Mont Blanc next to the outdoor fire-pit. Head chef Daniel Thibault is passionate about the quality of his ingredients and personally selects each supplier. Dishes include a fantastic cheese fondue with huge shavings of truffle, light tuna steak, lamb chops cooked with wild garlic, and beef tartare – it’s all mouth-wateringly good. The extensive wine list is equally brilliant – ask your waiter to recommend one of the local wines. Service is attentive without being intrusive and although it can get crowded the staff will do their best to seat you. Prices are at the higher end, a starter will set you back at least €20 while a main costs on average about €40 but the meat especially is good so prices are just about justifiable. Find it above the altiport. From the outside it’s a tarted-up gingerbread house, adorned with more bows, baubles and teddy bears than there’s space for, but inside Madame BaBeth’s little wooden cottage it’s much less busy and much more cozy. 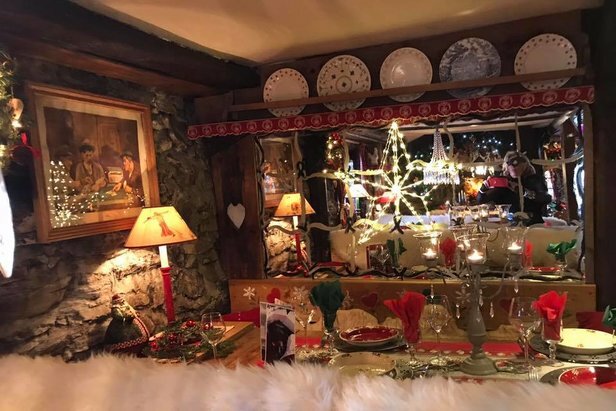 Stuffed with Christmas decorations and a lot of fur draped chairs, the atmosphere is welcoming, warm and fun - like hanging out in your mate’s living room (the mate that loves kitsch) with a bunch of your other mates. The owner, BaBeth, is an eccentric lady, loved by the locals who flock here often, and her staff are charming. Food-wise, tapas and white sangria are the order of the day. Starters cost around €16 and mains are typically around €30. It gets busy, it can get loud and the music will be turned up high. Go with a group of friends, a relaxed attitude, plenty of time (when it’s busy chances are you’ll be waiting a bit) and you’ll love it. We recommend the terrace at the back of the restaurant. Chez BaBeth is located in the Plane Dranse bowl, near the Chaux de Rose chairlift. The restaurant is tiny and has many regulars so booking in advance is essential. Perched on the edge of the Mangard piste leading down to Le Fornet sits Edelweiss, a wood and stone chalet that mixes modern with rustic. The food is traditional French food and is a cut above the rest: duck breast a la plancha, braised beef cheek, beef tenderloin, and the restaurant’s famous tartiflette – all supremely good and presented beautifully. Outside, there is a large sun terrace which offers magical views of the surrounding mountains. The tables can accommodate big parties – just make sure you book in advance. Prices are in the mid-to-high bracket. Starters cost between €15 and €20 and a main will set you back €25. A three-course meal from the set menu is available for a very reasonable €28.50 and a two-course meal costs just €23.50. A word of warning to the squeamish/lover of animals, foie gras features heavily on the menu so if that does not take your fancy, head to one of the other many brilliant restaurants around the resort. For chic mountain-top partying, you can’t get much better than Cloud 9. 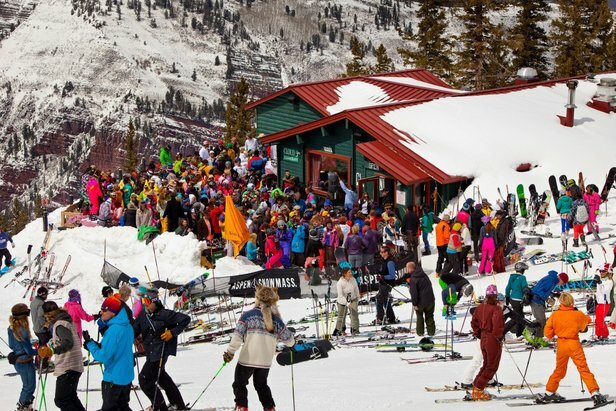 Formerly a ski patrol hut, the restaurant has a beautiful terrace which offers awesome views of two of Colorado’s most famous peaks – the Maroon Bells. Decadence is the word of the day here and champagne spraying is almost a ritual. The food is fantastic: the raclette and fondue have been described as out of this world, and the baked robila and braised beef short ribs are also excellent. The real attraction, however, is the atmosphere. Things get rowdy pretty quickly – think boots on tables apres-ski Austrian style. Staff are wonderful and are to be commended for putting up with so many drunken revellers. Word of warning: don’t come here for anything quiet or intimate – you’ll hate it. Book as early as possible – some people book weeks in advance. Find it at the top of the Cloud 9 lift on Highlands Mountain. To meat or not to meat? At Raven’s Nest it’s the latter. The restaurant, a relatively new addition to Whistler Blackcomb’s catalogue of eateries (17 on and off mountain restaurants), has put sustainability and environmental stewardship at the top of its agenda. Executive Chef Wolfgang Sterr believes that animal farming has a very large footprint with a negative impact on the environment. His passion for a less damaging more vibrant and healthy diet saw the birth of the Raven’s Nest - Whistler’s first vegan/vegetarian restaurant on the mountain. The menu is filled with meat-like dishes: Korean beef kim chi sandwiches, chicken pitta, meatball subs, chilli, as well as massive super-salads (beets, quinoa bean, root veg), mushroom bisque, garlic bread, cinnamon buns… Prices are decent starting at about $10 and are cheaper than many of the restaurants in Whistler village. 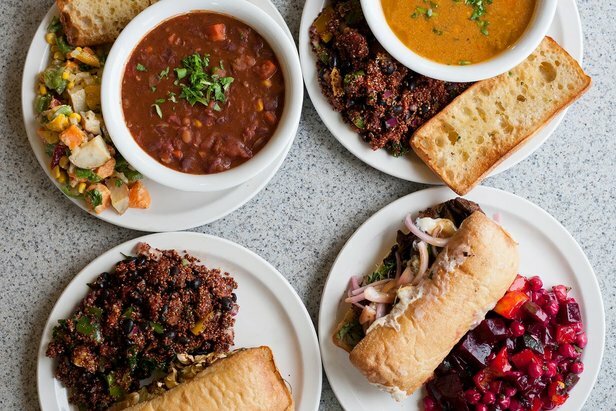 If you’re not totally on-board with the vegan way, there are a couple of off-menu meat options, which we think is pretty decent of them. To sum them up? Unsnobby, welcoming and accommodating – we like Raven’s Nest a lot. Find it at the top of the Creekside Gondola on Whistler mountain. Our tip? Grab a pew on the gondola side – the views here are the best on the mountain.